It’s not Air Conditioning Repair! It’s Air Conditioning Service that Keeps You from Having to Repair $$ or Replace$$…With LOWER ENERGY BILLS in the Mean Time! Salt Removers Corp. provides a vital air conditioning/heat pump treatment service to residents of coastal areas in the southeastern U.S., which is guaranteed to increase the life and efficiency of your coastal unit. Salt Removers Corp. sends a certified air conditioning service technician to your home, trained in the application process of removing damaging salt deposits from the outside portion of your coastal air conditioner/heat pump. Our tailored scheduled treatment service will remove the harmful corrosion causing, efficiency depleting salt deposits from your outside unit, increasing the life and efficiency of the unit. Every unit is different, we will custom fit a plan specific to your unit. Our salt removal service is guaranteed to increase the life and efficiency of your unit, with guaranteed savings above the cost of the service.. Since the air conditioner/heat pump is your largest appliance and largest consumer of electricity, increasing the efficiency of the unit will reduce your energy consumption and drastically reduce your electric bills. Air Conditioner Salt Removal Service will send a certified air conditioning technician to your home and remove the corrosion causing, efficiency depleting salt deposits from your outside unit. Salt corrosion can reduce the life of an air conditioner from a normal 10-15 years to as little as 3 or 4 years. Corrosion occurs from the salt air environment common to coastal areas. The salt air not only corrodes the unit, but also reduces the outside coils ability to transfer heat effectively, which seriously reduces the efficiency of the unit. If you live in a coastal area of the southeastern U.S. you probably have an air conditioner that is laboring under adverse conditions caused by salt corrosion. This corrosion causes your unit to work harder to cool your home, and as time goes on your energy bills will get higher and higher. In fact, salt corrosion is one of the biggest causes of premature failure and increased operating costs to coastal air conditioners/heat pumps. This cost thousands in increased electric charges and high repair and replacement bills. Air Conditioner Salt Removal Service is guaranteed to remove the salt, which will reduce your electric bill and extend the life of your air conditioner. Call us today to find out how to increase the life and efficiency of your coastal unit. 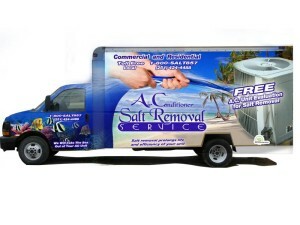 1-251-725-5513 Salt Removers Service will increase the life and efficiency of your coastal HVAC system!